While the nationwide application process for Amazon‘s HQ2 was largely shrouded in secrecy, New York City residents are finally starting to get some answers about the closed-doors deal. The city’s Economic Development Corporation (NYCEDC) released the city’s proposal to the public on Tuesday, along with a promotional website dedicated to HQ2. Some of what it reveals is expected—boasts about the city’s transit, talent pool, and local amenities—but it’s the concessions from the city that have raised eyebrows and triggered a trio of City Council hearings on the terms of the deal, the first of which was held yesterday. On Wednesday morning, the city council committee on economic development hosted Amazon’s vice president of public policy, Brian Huseman, and the NYC EDC President James Patchett. 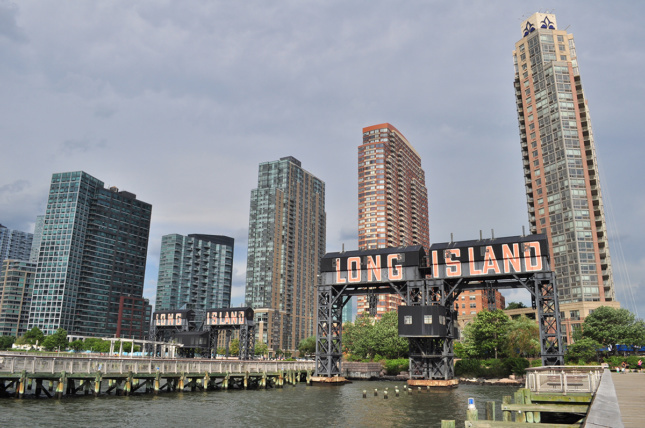 In a three-hour-long hearing, the two were given the chance to defend their decision to bypass the city’s traditional land use review process (ULURP) that would have lawfully determined how the new HQ2 will affect Long Island City, Queens, its projected home. We now know the deal was secured through a state-controlled process known as a general project plan (GPP), where large-scale and dense developments are scrutinized at a different level if they’re being constructed in a low-income area. Among the more controversial promises in the 2017 proposal is the offer to use eminent domain to gather more parcels for the campus and “override local zoning” to speed up and develop the campus in ways that the retail giant might want. 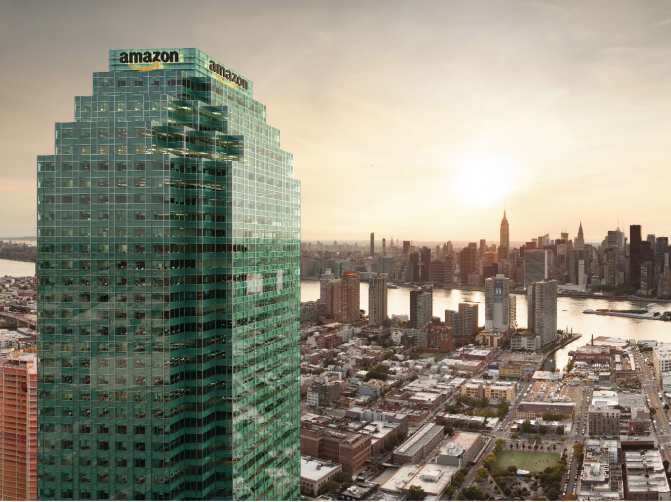 Of the potential sites listed in the proposal for an Amazon extension beyond One Court Square, Long Island City’s formerly tallest tower, about 20 are privately owned and only a handful belong to the city. One of the private sites in contention is held by plastics company Plaxall, where a potential apartment building or office tower will be constructed. Because this property is included in the GPP, it means that Plaxall and Amazon will altogether avoid ULURP approval through the city council. In yesterday’s meeting, led by Council Speaker Corey Johnson, council members questioned Huseman and Patchett in a series of fiery turns, each expressing serious concern over not only the physical development of Amazon’s campus, but also the company’s assistance to ICE, its employees’ rights to unionize, and whether it would help nurture local young talent in the area and promote diversity within its headquarters. Johnson, alongside Western Queens’ representative Jimmy Van Bramer, pointedly asked Huseman if Amazon would be willing to redirect New York’s planned $500 million capital grant to the four public housing developments near the site. Like many of the companies’ responses, Amazon tiptoed around the questions by citing its projected job creation numbers.
.@NYCMayor is cheerleading a deal that pays Jeff Bezos to build his gleaming tower in the sky, while residents of Queensbridge – many of whom are freezing because of lack of heat – can watch Amazon execs bypass the subways & land their helicopter on a taxpayer-funded helipad? Yesterday’s economic development hearing was fueled with anger over the off-the-record deal to lure the retail giant to New York. City Hall allowed a portion of the public to attend the meeting, where frequent outbursts by protesters disrupted the proceedings. In January, the city council committee on finance will focus on the city and state subsidies provided to Amazon, while a meeting in February will zero in on the potential impact the deal could have on Long Island City’s infrastructure, housing, and transportation. Once that’s over, the project plan will still have to be reviewed by the local community board and go through an environmental review. The mayor also announced a new 45-member Community Advisory Committee tasked with sharing information and gathering feedback on a number of issues, including public amenities, training, and hiring programs, as well as community benefits. The committee will begin meeting in January.